This breakfast whey formula is packed vital nutrients to help kick start your day. Breakfast whey is the ultimate shake for fitness enthusiasts and regular everyday people alike that struggle to find the time to prepare a breakfast full of goodness. Each serving contains 22g protein along with slow releasing carbohydrates and essential fatty acids. 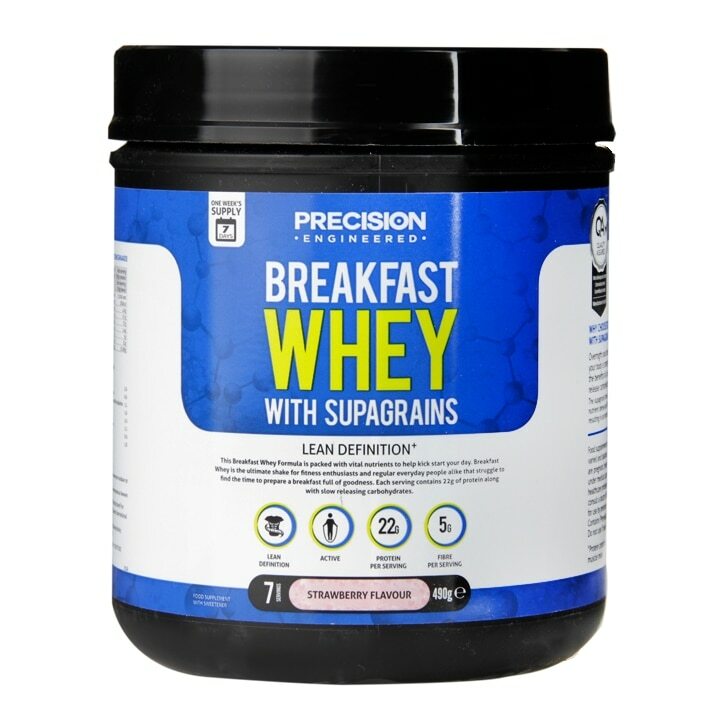 Precision Engineered Breakfast Whey Powder Strawberry is rated 3.5 out of 5 by 6. Rated 3 out of 5 by Ade4472 from Taste ok texture argh! This has become an important supplement for me having undergone bariatric surgery. Makes getting 60g protein a day easier. However there must be a way of re-engineering the formula so it doesn’t have the texture of eating gravel. Rated 1 out of 5 by Help from Im confused Ive used other protein shake and this is the third different one im trying the breakfast one. Im using a calories app and for the first time im confused with the measuremnts and calories. Its says 3 scoops of 60ml/grams therefore thats 180 and it says thats equivalents to 727 calories. Is that with milk? How bout just water? Im so confused and frustrated that everytime i use this, i dont know the exact calorie therefore i wont know if im taking enough calorie for my breakfast or not. Do i need less scoop? Or more? How much water needed? No idea so this is a no for me when calorie counting. Rated 4 out of 5 by Leon13 from Not bad for breakfast With the offer of H&B, it is certainly a good ratio of quality / price. So, I would recommend it. I like the flavor, but you have to mix it very well. I mix it with milk. Rated 5 out of 5 by Chrisw from Best tasting whey protein I have taken this breakfast whey in both strawberry and choc tastes and they are genuinely the best tasting on the market. The oats settle a bit in the shaker but that's normal. A great start to any day. A fascinating formulation with supergrains and I have felt energised and much more alert at work since taking these.